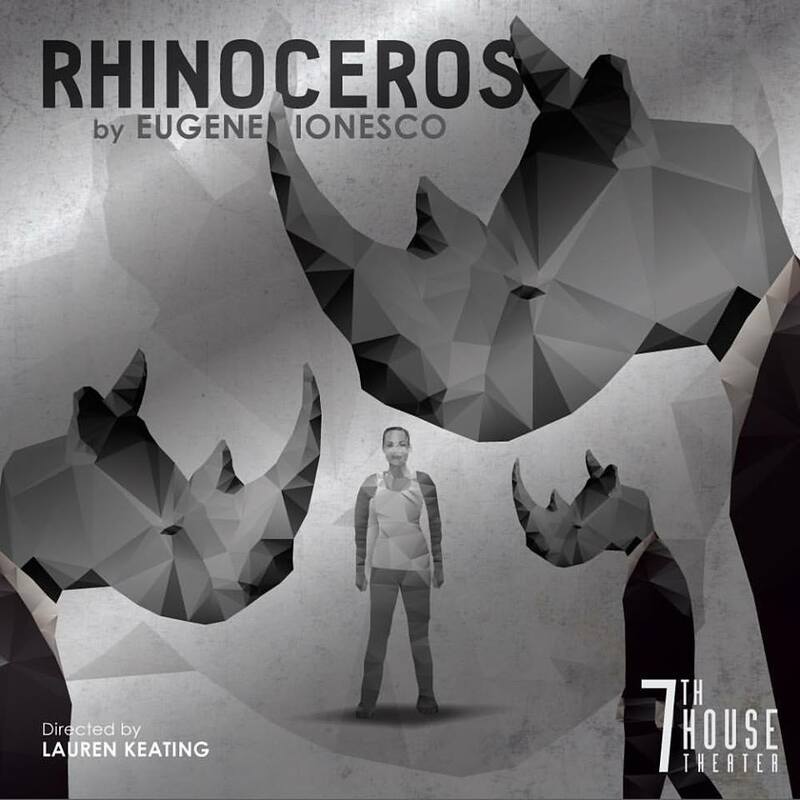 The basic premise of the play is rather simple: a quaint little town is disrupted when rhinoceroses are spotted running through the town and trampling things. It soon becomes apparent that the rhinoceroses were once people, as more and more people succumb to the "rhinocerotic movement." And it's not that they've caught a virus, but more that they've been brainwashed to believe that it's better to be a rhinoceros than a human. Soon our flawed hero Berenger (an excellent Ashley Rose Montondo) is the only human left, vowing "I will not capitulate!" despite witnessing everyone she knows join the movement, willingly or not. Despite the dark theme of the play, it's really quite amusing in the odd little every day conversations about nothing that the characters have with each other. Under the direction of Lauren Keating, the wonderful ensemble (which also includes Cat Brindisi, Arion J. Friday, Anna Hashizume, Kiara Jackson, Grant Sorenson, and Kendall Anne Thompson, with a surprise cameo by child wonder Mary Bair) performs in a playful, Ten Thousand Things sort of way, at times talking directly to the audience and luring us into this seemingly innocent world. Even with only ten days of rehearsal, they've managed to work in some charming movement and impactful music and sound (composed and arranged by Kendall on guitar, with Derek Prestly on percussion). The A-Mill Artist Lofts is a really cool and historic space right on the river, and the small room with just a couple rows of chairs in a U shape creates an intimate performance space. And not really important to anything, but I loved the costumes - suits, jackets, vests in a range of autumnal colors. We now live in a world where there's such a thing as "alternative facts," which I'm sure Ionesco would have worked into this play if he'd heard it. Some of the dialogue echos what we hear on the news so closely that it almost seems like they've changed the lines, except that I don't think they did. I think the play is just that prescient. Or maybe it's that history repeats itself. It would be terrifying if it weren't so funny. It would be funny if it weren't so terrifying. Please go see this urgent and necessary play (with just three performances and a small space, it's wise to get your tickets now). And watch out for rhinoceroses - they are not normal!